Evernote is a digital software program to collect and create content. Evernote can store all types of content including written, audio, video, images, pdfs. You can also create your own written content using many powerful features within Evernote including hyperlinking, checklists, formatting, reminders, voice memos, the table of contents creator and many more. Evernote is the ultimate content creation and storage system for all of your digital information. With Evernote’s Web Clippers you can collect information from the internet and send it to your Evernote account. You can share documents both privately and publicly. Evernote is a web-based program so your data is synced and can be accessed across multiple devices at any time. Evernote is based on the idea of creating notes (individual documents). You can also organise your notes into notebooks which are similar to folders. You can organise your notes according to a project, calendar system, or list of topics within a folder structure. Evernote also has useful planning features such as reminders and checklists. In some of our blog posts, we have offered free Evernote downloads for worksheets and templates. These templates can be freely accessed by clicking the links in each post. Evernote offer a Basic Account option that is free, however, you can also pay a subscription amount for additional premium features. 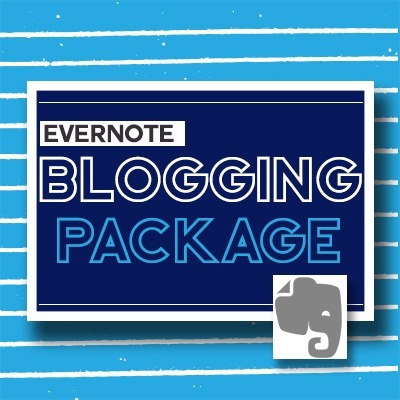 Evernote has a number of benefits that will help you create and manage your written content for your blog, general website content, ebook content, or course creation content. You can use it anywhere with access across multiple devices such as your desktop, tablet or phone. You will need internet access to sync your data. Use the web clipper feature to save links, images and whole articles for reference. The web clipper has features that will help you saved your data in an organised form. One of the benefits of Evernote is the use of its organisational features. 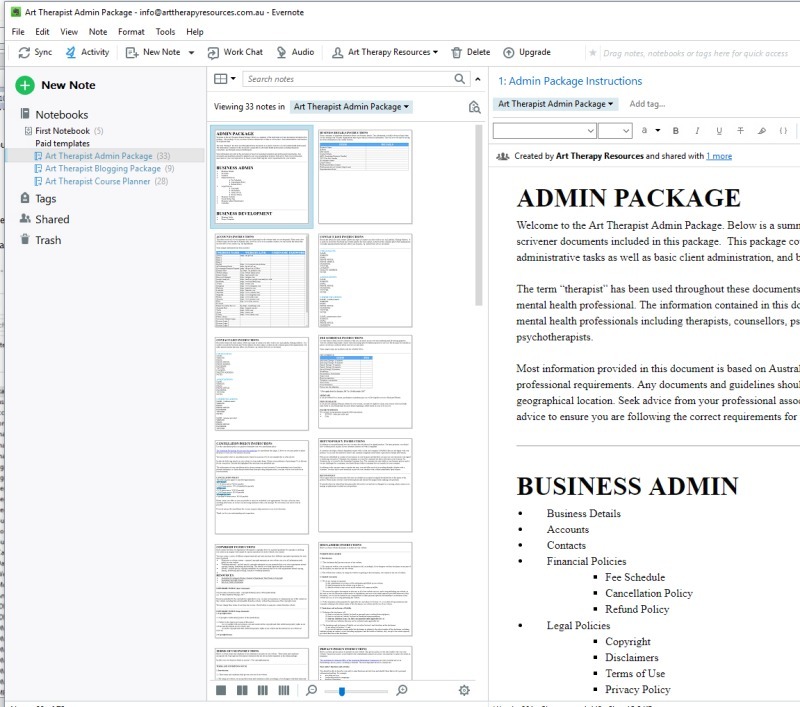 If you use Microsoft Word, you are limited to creating all of your blog content in one large document where your content is placed in one rigid order on a single document, or alternatively creating a multitude of various Word documents that require you to open and close each document every time that you want to write, edit, or access your content. Having multiple files can create a lot of excessive work for you in managing files and backups, in addition to being limited to accessing your content on one device. Your Evernote account is like carrying a filing cabinet around with you only in a digital format. Your information can be stored however you like to structure your content whether it be many or a limited number of individual notes. ￼The image above shows 3 panels of information, however, Evernote allows you to manage the way your notebooks are viewed. 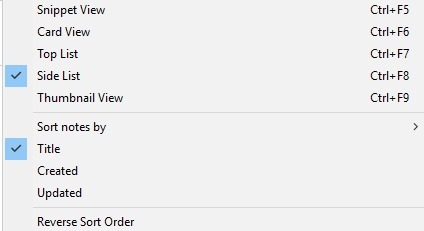 The below image shows the available options. As you can see in the above image we’ve shown the left panel, note list and note panel. 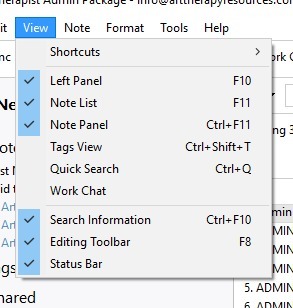 If you want to maximise your writing space, you can deselect the left panel and note list to not show and be left with only your notes showing. The words written in bold are considered NOTEBOOKS and the individual dot points are considered notes. One of the most efficient ways to use Evernote for creating blog content is to establish templates. You can use one master blog template or create a variety of templates based on the type of blog posts you create, eg. Book reviews, top 10 lists, art therapy exercises etc. 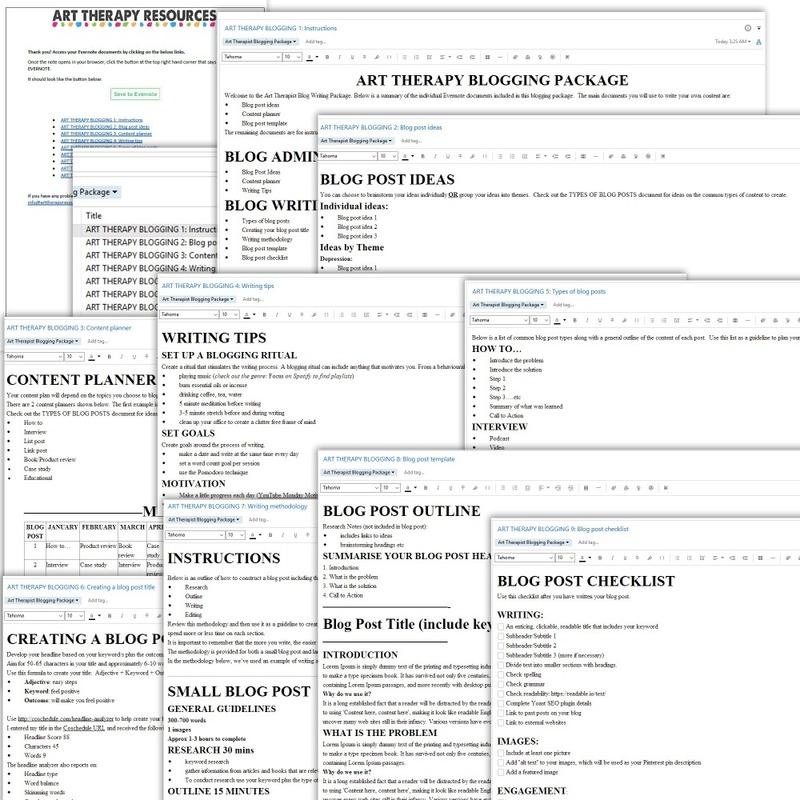 Templates can help you streamline your blog writing process and eliminate repetitive tasks in creating your blog post outline and formatting. 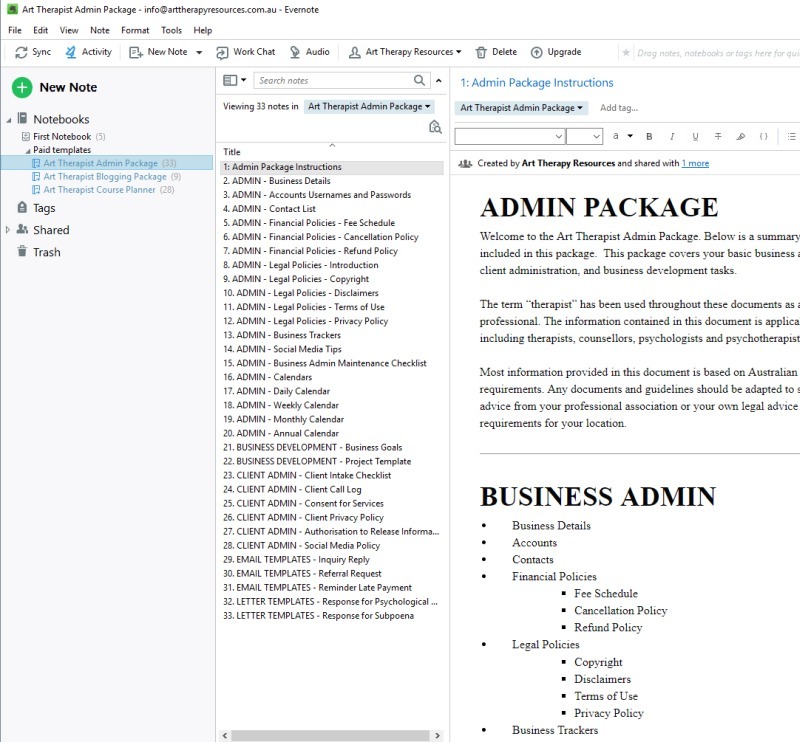 You can create your own templates to use, or alternatively, you can import templates that other Evernote users have created. You can also edit an imported template for any tweaks you have that relate to your writing. In addition to creating your template/s for your blogging content, you can also create a checklist to follow for each blog article that you create. A checklist can help improve your productivity by providing specific steps for you to complete for each post as well as ensure you are including important information in each post to help it be more internet friendly for effective SEO. Once you’ve established your network list, think about the categories that you feel might need improvement in developing. Or you would like more referrals from other professional sources. Or maybe you haven’t attended any educational events lately and feel you could add more external professional development to your network. Your business administrative networks are also important. Do you have a computer technician contact that can help with any data breaches or hardware problems? Do you know who to contact if your website or payment system goes down? The best method to establish and use your network effectively is to develop a system. The first process is to create a database of contacts and to make sure each contact is given context of their importance in your network. Once a month you should review your contact list and see if you need to engage with anyone on your list to strengthen your network. This might mean You should also review your list to see if you could engage in any marketing strategies with your networks. Most of your administrative networks involving communications and financial contacts can be established once and remain in place. Other strategic networks generally require more attention. This might mean seeking referrals, or running a workshop with a colleague. It could also mean engaging in your social media networks and offering your services as an authority in your specialty. Using your networks allows you to personalise your contact and engage in activities that are mutually beneficial. It is important to note that the focus of networking is to build relationships. This might result in immediate or long term pay-offs. Work in batches where possible. Eg. Create all blog post templates for a month at a time including blog title and general layout. Include a checklist at the top of each Evernote blog post note to ensure you have covered all essential parts of your blog post layout and content. 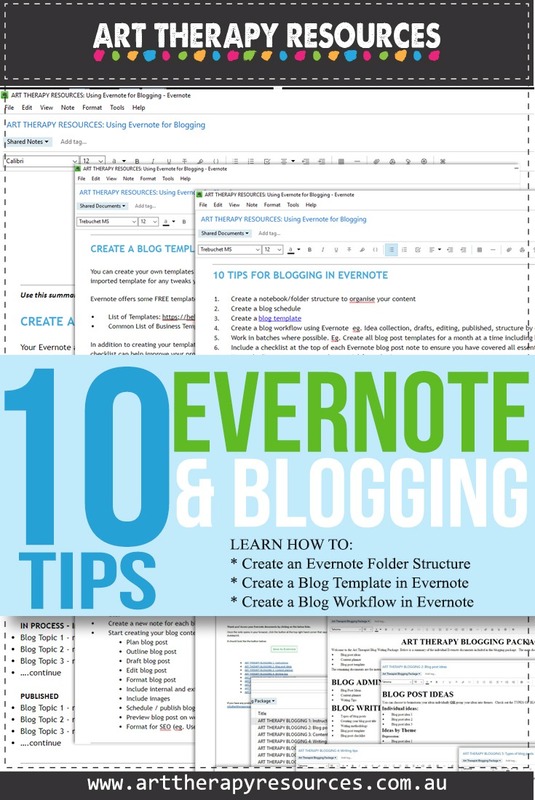 You can download a summary list of the useful links and tips for using Evernote for Blogging. You can save this note to your own Evernote. You can view the Evernote document even if you do not use Evernote.